ideal for drying of delicate salad leaves, standard lettuce varieties, prepared vegetables and delicate herbs. After the product has been washed, it is brought directly onto the infeed belt. The product to be dried is evenly conveyed to the centrifuge drum and the infeed belt ensures the minimal movement of the product. This infeed belt is also used as a buffering belt. The infeed belt moves forward evenly during the feeding period. On completion of the filling cycle, the drum accelerates to the pre-set optimal rotating speed to suit the specific product to be dried. Once the centrifuging cycle has been completed, the drum automatically slows down and rotate 180 degrees, the product is gently discharged onto the outfeed conveyor. The continuous production and centrifuging cycle without interruption and the infeed conveyor re-fills the drum. 1. 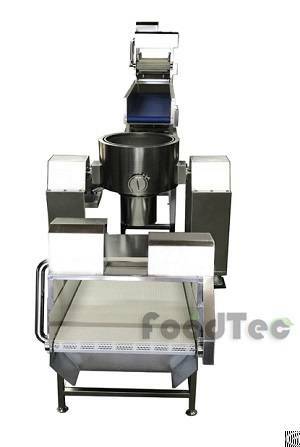 Applicable to leaf, root vegetables drying/dewatering. 2. The product to be dried is evenly conveyed to the drum at the optimal rotating speed. 3. The drum automatically slows down and rotate 180 degrees to gently discharge the product. 4. High pressure air knife will be activated which cleans all residual particles of leaf out of the drum during the discharge period. 5. The continuous production and centrifuging cycle without interruption. 6. Fully automatic centrifuging process is controlled by PLC or the wireless network to operate. 7. Significant saving of time, energy as well as labour.